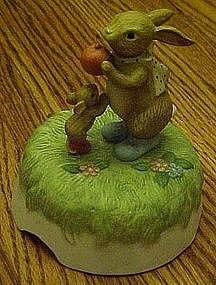 Cute hand painted bisque figurine is musical. Not sure of the tune it plays. Subject is a rabbit and a little mouse. Mr rabbit is holding a pumpkin as the anxious little mouse looks up at it. Looks like they may be in the garden as they are both wearing boots. Red foil Lefton sticker dates it 1972-1990. Measures 4 1/2" tall and is in excellent condition. On/off lever on the side.